When working with paper, especially for archival purposes, it is often important to have glue which can be reversed. 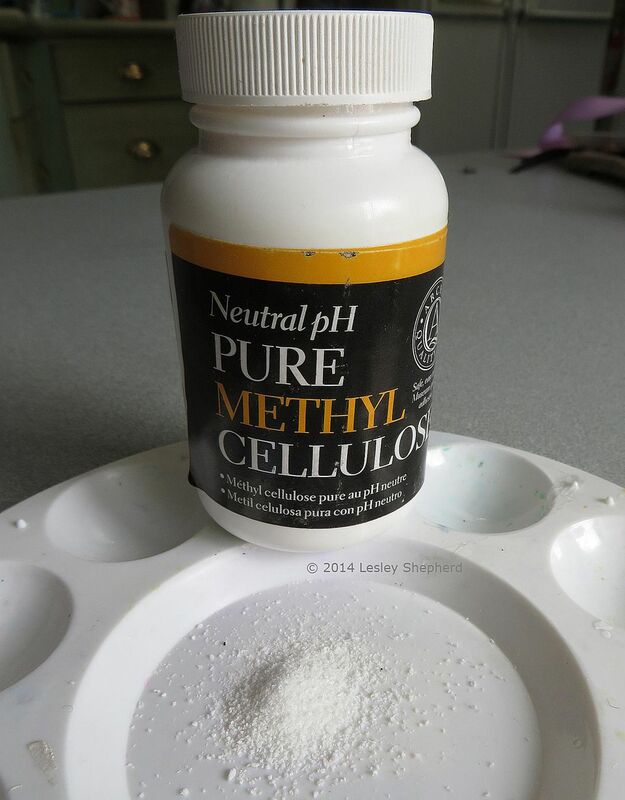 Methyl Cellulose (also methylcellulose), available from art supply stores, may be the best bet for gluing miniature wallpapers or assembling printables and paper models when you want to find an archival, neutral pH glue. Methylcellulose is a chemical compound based on cellulose, plant fibers. It is used for a wide range of applications, everything from a thickener to a stabilizer, or texture for food products and a fiber additive for foods. For miniaturists, it's most common applications are for use as a paper and wallpaper glue, or for use as a "size" when marbling paper and fabric. How Do You Mix and Prepare Methyl Cellulose From the Powdered Form? When preparing methylcellulose, methods vary, although most suggest dissolving it in the cold, or room temperature water. Once properly dissolved it will form a clear viscous solution or gel. It is best to whisk the powder into the water until it is dissolved, then leave mixed methyl cellulose overnight to 'gel' before use. For craft purposes, prepared methyl cellulose glue can be mixed with PVA glue to give PVA a longer working time (slower drying time) and more 'slip' on paper. Methylcellulose glue or adhesive has a neutral pH, is non-toxic, vermin proof, non-allergenic and dries clear. If you mix it in a dilute solution, it will dry with a matte finish. It isn't affected by heat or freezing. Its use as glue can be reversed with cold water, making it ideal for archival purposes involving paper. It is often used for paper repair and bookbinding. It is not suitable for use in high humidity. The bonds made with methylcellulose are very flexible, but not particularly strong. "Recipes" for methylcellulose vary widely as it is used for so many things. For marbling size, a mixture of 3 tablespoons to 1 gallon of water makes a size thick enough to hold paint on the surface. The mixture must be thoroughly stirred every few hours and let stand overnight. The standard mixture for methylcellulose as a glue is 1 part methylcellulose to 16 parts water at room temperature. Stir thoroughly and leave overnight, stir again. This mixture can be stored for a long time in glass jars. You can find methylcellulose powder in many art supply stores. Some wallpaper pastes are made of methylcellulose, usually with fungicides added. The methyl cel powder keeps indefinitely if stored in dry conditions. For miniatures, mix very small quantities. One tablespoon to a cup of water is the normal ratio. Or 1 teaspoon to 1/3 cup of water, but the powder we have suggests using 1/2 teaspoon to 1 cup of water. Experiment to find the thickness that suits your purposes best.